The National Weather Service has issued a Wind Chill Advisory in effect from 8pm this evening to noon EST on Monday. * WHAT…Very cold wind chills expected. 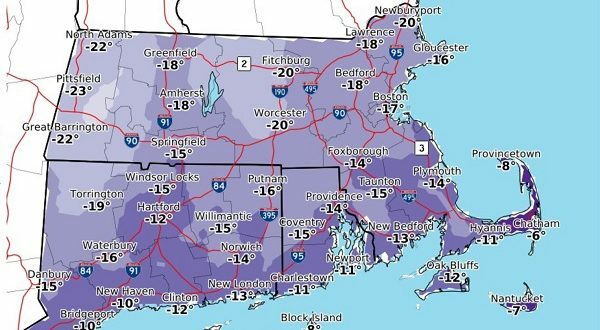 The cold wind chills will cause frostbite in as little as 30 minutes to exposed skin. Expect wind chills to range from 5 below zero to 20 below zero. * WHERE…Portions of northern Connecticut, central, eastern, northeastern, southeastern and western Massachusetts and northern Rhode Island. * WHEN…From 8 PM this evening to noon EST Monday. * ADDITIONAL DETAILS…If outdoors this evening and overnight, take frequent warming breaks.